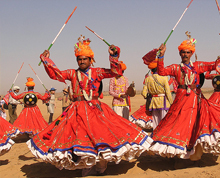 Rajasthan is rightly known as "The Land of the Royals". The state has a rich heritage of culture. The geographical drawbacks of the state, motivate the people of Rajasthan to add color to their life. Amalgamation of various aspects like arts and crafts, music and dance, festivals and faith, cuisine add zeal to the culture. The people strive to keep their traditional practices alive down the ages. The splendid palaces, speak about the workmanship of the artisans. Exquisite pieces of architecture are innumerable such as their Havelis, Forts and Temples. The state has the pride of being traditional and colorful. The people are gifted with exclusive craftsmanship. The state is home to major art and craft traditions like Pottery, Tie and dye textiles, Wooden craftsmanship, Jewellery designing, Hand Block Printing, Leather work, Puppetry and many more. Under the Tie and dye printing Bagaru prints, Sanganer prints occupy a significant place. 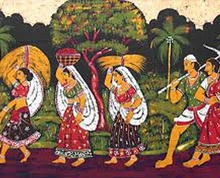 Bandej and Bandhani are the traditional designs of Block Prints in textiles. Rajasthan is highly acknowledged in the field of jewellery design using Semi-Precious stones. Traditional Kundan Meenakari jewellery is delight of every woman. Handicrafts using wood, ivory, lac, brass, silver are shopper's delight. Another notable craft is in the field of footwear. The footwear of Rajasthan is world famous, known for its workmanship using metallic thread embroidery on leather. The state is renowned for its carpets: woolen and cotton. Jaipur, Bikaner, Tonk are warehouses of this trade using exquisite or traditional designs. Pottery using Terracota is a shopper's delight adding glitz to their home's décor. Mirror work on textiles is a flourishing trade of Rajasthan. The state possess' a rich heritage in the field of arts. The vibrant and colorful Phad paintings are a true delight to the eyes of the beholder. The wall paintings on the palaces, speak tales of heroism, valor, romance that are colorfully depicted. Frescoes are exclusive pieces of art, which stand as a testimony of the rich culture of Rajasthan. "Puppetry " otherwise known as kathputlis has been in existence since ancient times. Puppets were made and dressed in vibrant colors, so as to grab the attention of people. They were made to perform to different variants of folk music. Music and dance has always been the threshold of Rajasthan's culture. Any celebration is incomplete without it. Some of the traditional forms of dance: Ghoomar of Udaipur and Kalbeliya of Jaisalmer. The attire of women for the traditional dance is Ghagra with large number of bangles up to their arms. Music has always been the pulse of Rajasthan's culture. The musical instruments widely used are Dholak, Sitar and Sarangi. Folk songs speak of tales of heroism, valor of kings accompanied with synchronizing music. Folk music and dance, proves to be a special attraction to tourists. Nowadays, it is interesting to note that youngsters have a fondness for traditional music. Festivals and celebrations add spice and zeal to our life. 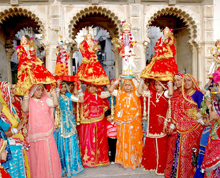 Rajasthan has a huge backdrop of festivals and fairs. The important religious festivals of the state are Teej (Advent of monsoon), Dussehra, Holi and Diwali. Some of the famous fairs include Pushkar fair, Baneshwar fair, Kite festival on 14'th of January, Summer festival, Camel festival and Nagaur fair. Festivals are celebrated with great pomp bringing together various sects of people. People of different religious sects such as Hindus, Jains and Muslims live in harmony. Temples fortify the rich heritage of Rajasthan. Some of the famous religious testimonies are Pushkar temple (Lord Brahma), Ajmer Dargah, Dilwara and Mahaveera Jain temples. Forts of Rajasthan are renowned for their architectural splendour. Prominent forts and palaces include Mehrangarh Fort, Jaisalmer Fort, Chittaurgarh Fort, Hawa Mahal and Udaipur Lake Palace. Rajasthan proves to be a delight to everybody's taste buds. Extensive cuisine is the secret of its popularity. The kings of this region, were fond of good food and employed chefs with great culinary skills. Rajputs were fond of Shikar meat, sule smoked kebabs and game meat dishes. The Maheshwari sects were strict vegetarians and never lagged behind in their extensive cuisine. Popular cuisine includes dal bati churma, ladoos of Jaisalmer, mawa kachori of Jodhpur, Ghevar of Jaipur, sohan halwa of Ajmer and Bikaner bhujia. 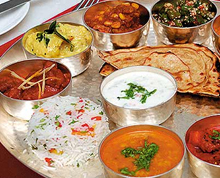 Rajasthan is a perfect destiny of splendid cuisine. People of Rajasthan are simple and warm, accompanied with hospitality. The magic of Rajasthan stands unparalleled in its rich cultural heritage.